Not too long ago, I finished a Pt. Hope kayak. Above is a picture of the frame, finished except for a coat of red paint and a cockpit coaming. Below is a picture of the boat floating empty. For those of you not up to date on Alaskan geography, Pt. Hope is on the Arctic Ocean, north and east of the Bering Strait that separates Siberia from Alaska and about 300 miles southwest of Pt. Barrow, Alaska's nothernmost settlement. Check it out on Google or one of those other map programs. It's a short boat, 13 feet long and it has a lot of rocker. As you can see, the first and the last two feet of the boat don't even touch water when the boat is empty. When the boat has me in it, that's a different story. Short performance summary: This boat has no directional stability. It paddles straight as long as you paddle. Once you stop though, it wants to turn to one side or the other. When the boat is empty, you can push on either end and it rotates on its own axis. The same goes for when you're in the boat. You sweep your paddle and the boat spins on its axis. Turning radius: 7 ft. 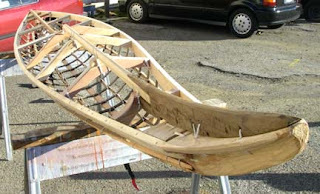 I imagined this to be a good bay boat for short choppy conditions, one to two foot waves. Those will be coming along soon. I'll report back after I've paddled some of those. This is not SPAM. We're not talking manhood here. We're talking paddle length. Back about a decade or so, John Heath published an article in Sea Kayaker mag on Greenland paddles and their anthropometrics. Ever since then, when you show a paddle to anyone, they reach over their head with their arm outstretched and their fingers curled over at the first joint from the tip and tell you that that's how long a paddle ought to be. Yeah maybe. That's a good start if you're 5' 6" tall and paddle a Greenland boat with a 21 inch beam with a deck that's almost flat. If you paddle a boat that's wider or deeper or you're taller or shorter or you don't paddle for a living, you might want a paddle of a different length. There are some websites that have developed algorithms for determining the right length of paddle for you. You answer about 20 questions like how wide your boat is, how fit you are, how strong you are, how tall you are and so on and then tell you what length your paddle should be. Maybe. The truth of it is, there is no magic formula to determine what length of paddle is just right for you. Judging by the paddles that people are using and the results they're getting, people are not getting good advice on paddle sizing. The only way I think that you can get the right paddle for yourself is to try a bunch of different paddles and see what feels right to you. And nothing ever stays the same. The more you paddle, the stronger you get and the kind of paddle you can handle changes. If you get a boat with different dimensions, chances are, you need a different paddle. So anyway, all this is a long pre-amble to the topic of long paddles. If I use the Heath anthropometrics, I get a Greenland paddle that's 87 inches long. But we know that the Greenlanders weren't the only ones making paddles. 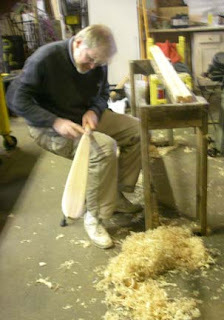 I used to make my Aleut paddles about 90 to 92 inches long. But some people with wide boats and people who felt more comfortable with a slower paddling cadence wanted paddles that were even longer. I made one Aleut paddle 102 inches long. But most recently, in corresponding with Jeffrey Dickrell of Unalaska, I found out that Aleuts made paddles that were even longer. I won't go into details here because Jeff has an article coming out in Sea Kayaker mag on the topic of long paddles and I'm going to hold off on posting any pictures until after his article is published, but in any case, I've made a nine foot long (108") and a ten foot (120") long paddle for purposes of testing the long paddle idea. Results will be posted in the not too distant future. 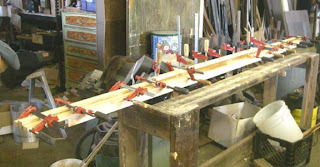 So here's a photo of the nine footer being glued up. I used redwood which has similar strength and density characteristics to red cedar and is available in discount lumber stores. The Aleuts supposedly used western red cedar for their paddles. Given the dimensions that they built them to, I'm not surprised. 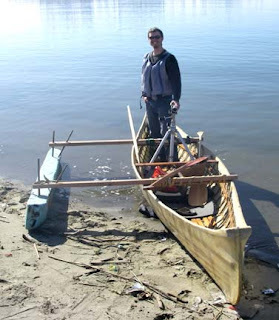 This is a picture of Matt in an outrigger canoe fashioned of salvaged floatation and a skin on frame canoe. The booms are salvaged 2 by fours cut down slightly to save on weight. Anyway, this scheme allows one to stand up in the canoe, drink beer, etc. Stuff you wouldn't want to do if this thing didn't have an outrigger. Matt is standing behind his tripod. We had been floating around Alameda's seaplane lagoon with me lounging in the bow and Matt shooting video of me talking. He's doing a video of various people who are self employed doing things they like. The idea behind the video is that young people who can't quite figure out how to make a living doing what they like can get some inspiration and ideas from people who are doing what they like. Now here's a photo of a Hawaiian outrigger canoe paddled by a crew of six. They should probably be sailing this thing instead of paddling, but I think they all have desk jobs and need the exercise. Off to the left in the foreground is Dave in his Greenland style skin boat and behind him, David in an Aleut Baidarka. This was the baidarka's maiden voyage. David needed to adjust the seat on his boat and we all wanted to get on the beach and stretch a little. 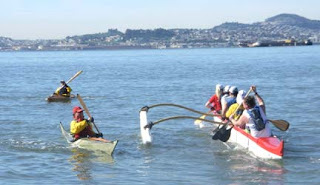 The outrigger people told me that there's something like 3000 people in the SF Bay Area paddling outrigger canoes. Popular sport. Ok, moving the blog to a new home. I've already figured out that this interface is a little, how shall we say, crude? I just typed in stuff and lost it when going to preview. Never mind, I hadn't typed much. So let's go with the pictures. So this retarded interface adds pictures at the head of the text so I have to move it to where I want it. I would like it to add pictures to where my cursor is at. Never mind, this thing is free. They're doing me some sort of favor, so I'll stop complaining. 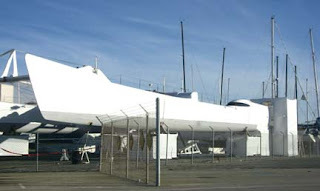 This thing up there that you're looking at is the front of Steve Fosset's, God rest his soul, now that he's officially declared dead, boat that he set the world record solo around the world sailing time in. For some reason it ended up in the boat yard just down the street from the shop. 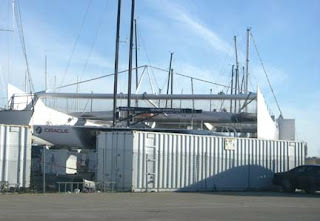 Those are 40 foot containters out front of the boat there, so beam must be something like 50 feet. And here's a shot of the thing from the side. Must be at least 100 feet long. Anyway, Steve is officially dead, lost in a small plane somewhere over Nevada and someone else will be sailing this thing.